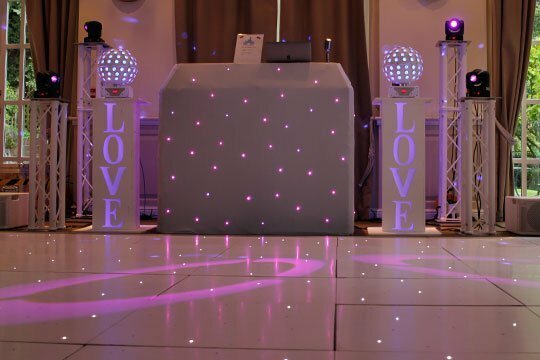 I offer a variety of DJ, Disco and Wedding Services in the Kent area for your wedding from evening discos to all day weddings. An amazing experience using special effects for your first dance. 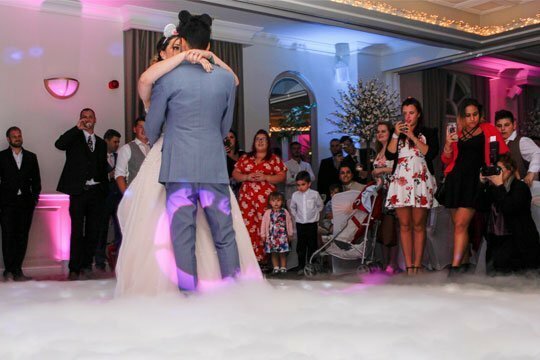 Your family and friends are gathered around the edge of the dancefloor… the music strikes up, clouds appear and float across the dancefloor as you step forward onto the dance floor for your first dance… a truly magical effect created with a very special dry ice effect machine. 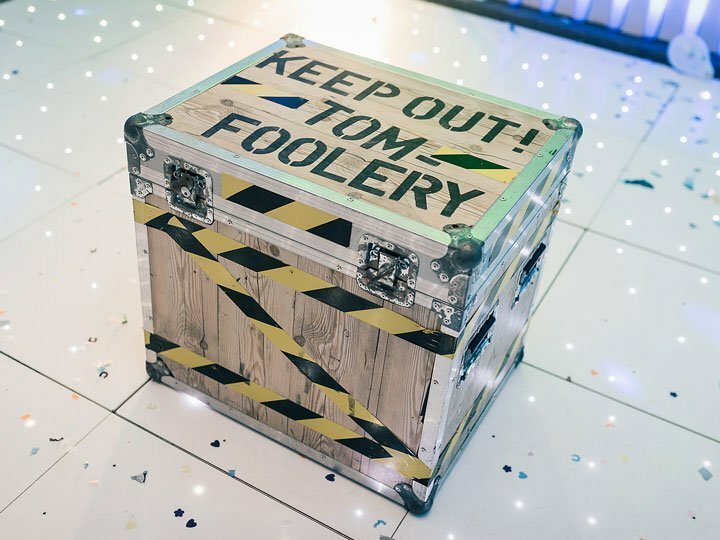 A large crate is set in the middle of the dancefloor… It’s wrapped in hazard tape and on the lid it says “Keep Out – Tomfoolery”… It’s intriguing, what could it be… We start off with a few photos of you posing with the crate, then, you open the lid to reveal the Tomfoolery Box is filled to the brim with new props (hats, wigs, sunglasses, inflatable instruments… all sorts of things) for you and your guests to keep. 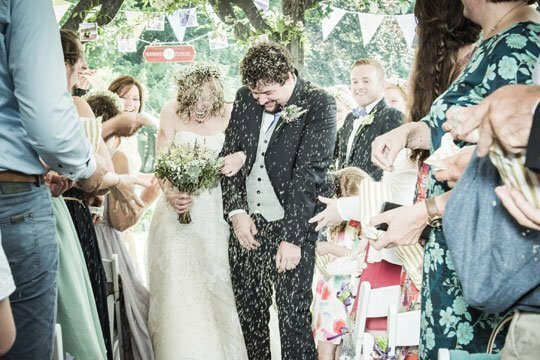 You distribute the props to your guests, the music ramps up to full-on party vibe and the dance floor is guaranteed to be full. It will fuel the fire and transform your wedding reception from “FUN” to absolutely “OFF THE SCALE”. An amazing experience for your first dance. Imagine being introduced for your first dance. As you take to the dancefloor as newlyweds, the floor erupts into a sea of twinkling white lights. “Painting” the room with light. 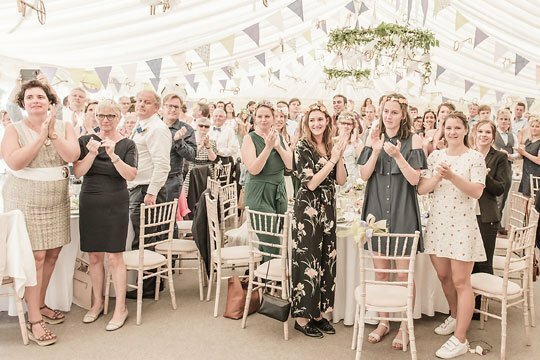 Guaranteed to transform any wedding venue from a village hall to a stately home or marquee, mood lighting is an increasingly popular choice for brides who want to wow their guests. 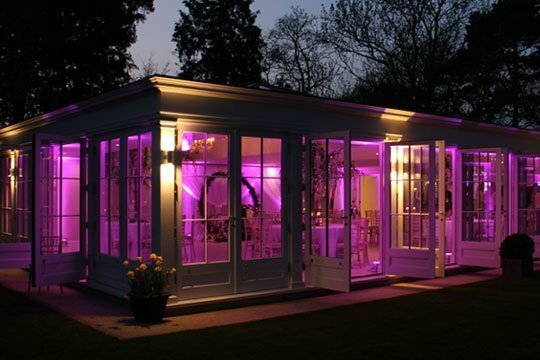 Mood lighting can be used to highlight features in the room or just to “repaint” the whole room in any colour you like! The Master of Ceremonies is there to guide your wedding day and keep timings and events on track. To gently guide and inform your guests so your friends and family will be as involved in your day as much as you are. Speak to me about how I can help bring fun, imaginative ideas to your day that will keep your guests engaged all day. Why would you want a DJ all day at your wedding? When couples first enquire about my services, naturally the first thing most of them think about is the evening party. However, more often than not I’m booked to provide music throughout other parts of the wedding day from the Wedding Ceremony and Drinks Reception to the Wedding Breakfast and Evening Party. All day wedding hosting doesn’t have to be just playing your music, having me as your all day wedding host allows you to relax. I can liaise with your other suppliers and your venue to make sure your day runs smoothly, whilst being there all day I can provide peace of mind! Let your wedding venue manager take care of the food and drink. I will take care of you, your family and your friends in a fun, relaxed and informal way. I will make sure your introductions and announcements are meaningful and clear and delivered with sentiment and emotion. By having me all day I can also bring a few fun interactive elements to your wedding breakfast such as my pearl of wisdom cards, or how about a quiz about you both during your meal? With so many great ideas why not book a consolation to discuss what you want for your wedding day!